The Whisky Show is the UK's most important whisky tasting event, showcasing the very finest examples of the distiller's art. The inaugural event, held in 2009 at London's Guildhall, was attended by an international audience of visitors from as far afield as Hong Kong, the USA, India and Japan, as well as passionate aficionados from all over Europe. 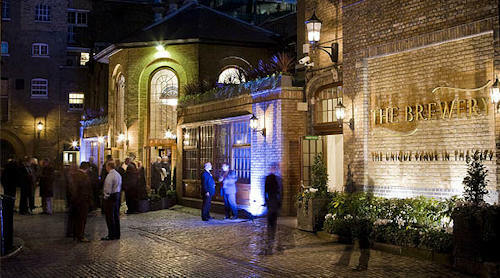 This year's event will be taking place at a bigger venue – The Brewery in London's Barbican at the heart of the City - to accommodate the increased demand generated by the rave reviews the inaugural Show received, which created a global buzz within the whisky industry. A dedicated Whisky & Food Matching area has been added – and once more all tasting samples, food pairings and a hearty two course meal will be included in the ticket price. The Whisky Show supports responsible drinking. "…Just wanted to say a huge thanks for organising a superb show! It was easily the best that I have taken the brand to this year." "I think that the event was wonderful, fantastic venue and a great clientele." "There was a very high quality of customer, especially on the first day. I made many good contacts, even with potential customers from abroad. It was much more international than I had expected. Thank you for putting on such an excellent event. I would be very happy to participate again next year. " • The Whisky Show is a luxury whisky event that showcases the finest examples of the distiller’s art to city professionals and fine whisky consumers alike. • After the roaring success of 2009’s inaugural event, this year’s expanded Show is taking place at The Brewery in London on 29th-30th October 2010. • Focusing on premium whiskies above each brand’s standard expression (longer-aged whisky, new releases and special bottlings). • Generous portions of luxury whisky-themed food in the Whisky Diner.• Two bars serving delicious whisky cocktails. • A range of delicious food-pairing suggestions, with the new addition this year of a dedicated Whisky and Food-Matching room at the event. • Sensational Masterclass tastings, hosted by some of the most famous names in the industry and featuring some truly spectacular whiskies well above the standard fare offered at other whisky shows. Glenmorangie, Highland Park, Springbank, Glenfiddich, Laphroaig and Johnnie Walker. • Entry to the event and a free tasting glass. • Free samples of any exhibited whisky – there is no voucher system at The Whisky Show. • A hearty two-course meal at The Whisky Diner. • Access to the Whisky and Food-Matching room and free samples of the featured pairings. "Your event was fabulous. Very enjoyable, educational and the most civilised of shows."